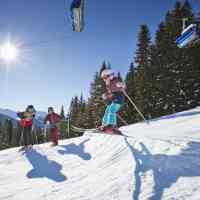 Spend your ski holiday in Leogang directly by the slopes at the winter sport hotel Bacher. Hit the gondola cable car without detours in the morning and take your last swing of the ski day right outside the hotel terrace. 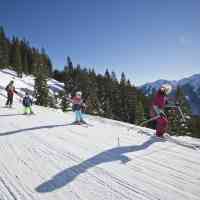 Discover 270 km of slopes around four winter sport places with one ticket in the Skicircus Saalbach Hinterglemm Leogang Fieberbrunn. 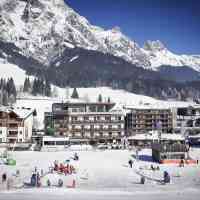 This makes this ski region in the province of Salzburg one of the largest in the whole of Austria. The perfectly prepared and snow-covered slopes and ski routes provide a snow-sure experience for beginners, intermediates and experts. 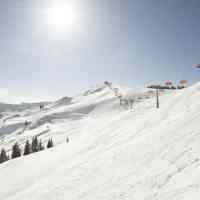 Furthermore, you have the varied choice between snow parks, freeride parks, floodlit slopes and toboggan runs. 140 km of easy blue slopes: easy-to-ride, wide slopes for families, skiing beginners and adults going for their first ski glides. 112 km of intermediate red downhills: for skiers with advanced skills and some experience, without difficult / very steep passages. 18 km of difficult black slopes: for very good skiers with narrow, steep parts and technically challenging passages. Learn more now about the current ski pass prices and lift and slope status. The webcams also allow you to take a look inside the ski region of Saalbach Hinterglemm Leogang Fieberbrunn, and see both weather and snow situation yourself. Tip: Use the affordable Bacher ski package with included ski pass! It doesn’t get any easier; the offices of ski schools with ski rental can be found directly inside your ski hotel in Leogang. Have a consultation on the selection of group courses suited for you and your children, or book a private guide for your personal off-piste adventure. Accurate ski fitting ensures that you’ll be skiing with ideal equipment. By the way, book courses and skis online before your arrival and enjoy substantial discounts. The area in front of the terrace of Hotel Bacher turns into Leo’s Kinderland in winter. Little slopesters have their first experiences on skis, or simply have loads of fun playing in the snow on the 1.5 ha lot. And there’s lots of snow until the end of winter thanks to the artificial snow machines! Even the littlest Bacher guests are outside with childcare: Time flies by while tobogganing, building snowmen and playing. Children aged three to six are lovingly looked after by experienced child carers for a few hours or full days during the winter season. They head outside when weather permits. But there’s also a lot to experience inside Villa Kunterbunt: The little ones can let off steam and let their imagination run wild while painting, doing crafts or playing together.